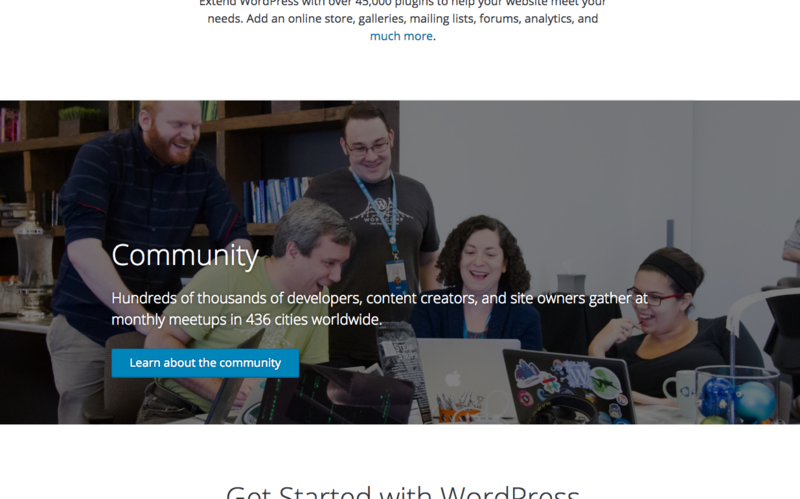 There should be a button in Community Section on WordPress.org page saying something like "Find WordPress Community Near You". 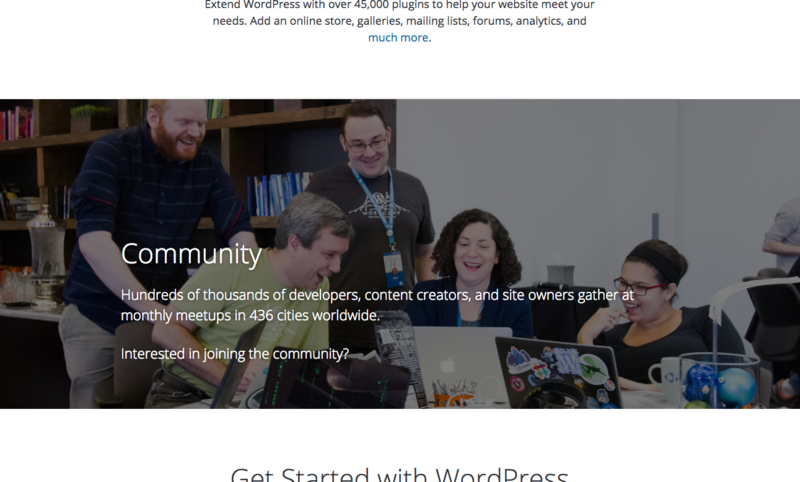 This should help in increasing the awareness about local WordPress communities. I think it'd be better to link to ​https://make.wordpress.org/community/meetups-landing-page (like the Core Events widget does), rather than directly to meetup.com, since that'd give us more flexibility and DRYness. See ​https://github.com/coreymckrill/nearby-wordpress-events/issues/9 for background. Although, I wonder if it'd be better to just say something like, "Interested in joining the community? Just login to wp-admin on your site and enter your location in the WordPress Events and News widget." That might be better long-term, since they'd see it regularly instead of just once when they manually look for it. It'd also include WordCamps in addition to meetups. It might be best to avoid using the word "widget", since that might confuse people into looking in at Appearance > Widgets instead of the Dashboard. Here's some quick mockups around this idea. The button stands out more, but seeing as none of the other sections have a button (except for the Get WordPress), it's probably too much. The link doesn't stand out at all, but none of the links are very obvious on this homepage. Do we change all links so they stand out better, or just this one? I like the link best b/c it aligns better with the other sections. Maybe just a bit more work needs to be done with it? Does the mockup show it in white instead of blue just because it was a rough draft? Or is there a reason to not make it blue like the others? From a laymen's perspective, adding a blue link seems good enough to achieve the goal of this ticket. We can always iterate on the overall design later to make all the links more visible. The blue was not readable against the dark background. Something that might work here, is to have the link be underlined when the user hovers over any part of the whole section. Something that might work here, is to have the link be underlined when the user hovers over any part of the whole section. On a related note, Community appears to be the only section that's not centered, is that intentional? Yes, after discussions with Matt, that's what was agreed upon. @iandunn You are right! This button should take to the landing page URL mentioned in above comment. The button works better, in my opinion. I'd go for that over the link. What about a secondary button, so it doesn't conflict with the primary button in the following section? I'd also recommend updating the button copy to be action-oriented, similar to @divyadeepsawhney's suggestion. Let's go with this, @obenland. New text for a stronger CTA. Secondary button class so it's no longer blue. Adds a button link leading to the community team's meetup landingpage to make it easier for visitors to engage with their local community.